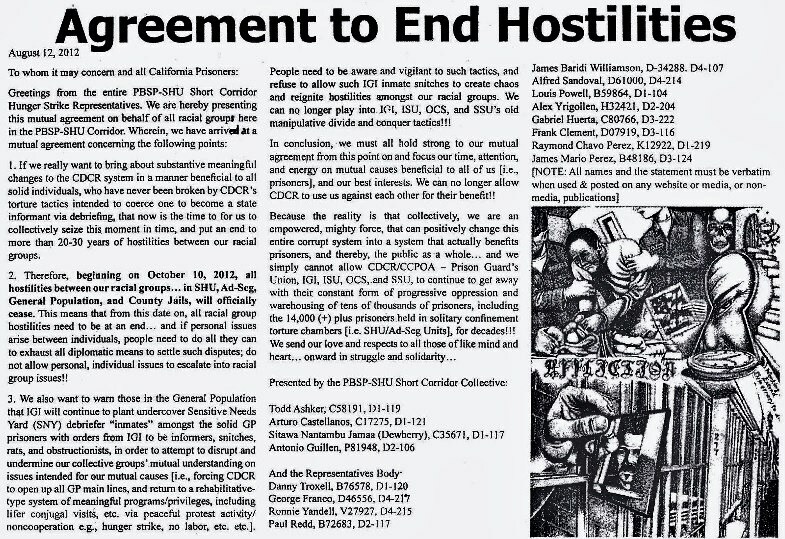 As you may know, the genesis of the Mediation Team was a request from hunger striking prisoners for an intermediary to enable negotiations between the Pelican Bay SHU hunger strikers’ representatives and CDCR officials. The current team was pulled together, and we met several times by phone and in person with Scott Kernan and other CDCR officials to advocate for the prisoners’ five core demands and to suggest ways that CDCR’s goals and the prisoners’ concerns could be concurrently met. We have had and continue to have close communications with—and the trust of—SHU prisoners. It is from this experience that we offer the following response to the STG policy proposal. The primary stakeholders are left out of the review process—the prisoners. All prisoners who have been or might in the future be validated are stakeholders. In addition, evaluating the STG proposal definitively is not possible because its real meaning and ramifications will become clear only after implementation. Currently, the disparity between the validation/segregation criteria on paper and their implementation in practice is enormous. The proposal offers nothing to give us confidence that the new policy will fare better, except a cursory reference to staff training. SHU that does not require debriefing. 2. The Department has signaled its intent to change from a strictly “intervention and suppression” approach to a more behavior-based strategy. The change is not clear in this proposal, however, because many provisions are inconsistent with a behavior-based approach. 3. The Department will be reviewing everyone currently in the SHU according to the new criteria and potentially moving a large number to general population. The Step Down Program as proposed is not a true alternative to debriefing. The proposal provides for no independent review of decisions regarding validation and segregation. In other ways, too, it fails to assure the accuracy, objectivity, and fairness of these decisions. The distinction between association and behavior is not clearly drawn. The reach of the validation net is greatly expanded. The proposal establishes no time limit on SHU confinement and fails to lessen the extreme isolation and sensory deprivation. 1. The Step Down Program (SDP) as proposed is not a true alternative to debriefing. One of our biggest disappointments with this proposal is in the general outline of the Step Down Program. We had truly hoped that CDCR was going to present a viable alternative for people who want to demonstrate that they are not gang involved, or would like to move out of past gang involvement. We fully understand that CDCR must maintain safe conditions for all within prison walls, but other states (e.g., Mississippi and Connecticut) have clearly demonstrated how severely reducing the population in solitary confinement is possible while simultaneously reducing violence in the prison, prison costs, and recidivism. Simply put, four years does not represent an incentive program; rather, it represents a punishment program under a different name. Moving from Stage 1 to Stage 2 yields the prisoner $11/month additional canteen, one annual phone call, and a deck of cards. Such a minimalist incentive structure is unwarranted. Although some programming incentives are provided very slowly, the Department retains total discretion over what constitutes “criminal gang behavior,” a term which is vaguely defined and could include entirely innocuous behavior, such as greeting someone or possessing literature. Does this term delineate behavior that indicates affiliation with a “criminal gang” or “gang behavior” that is, of its nature, criminal? We must recognize that prisoners who have been locked down for long periods ol time will not usually have the capacity to be,* a meaningful process of “study” in their cell in a focused way using videos or written materials. They will also definitely need human interaction in order to be successful. Continuing to isolate people fur two full years and allowing them contact with others thereafter (at some points limited to cages) is not a model for re-socialization or rehabilitation. 2. The proposal fails to assure the accuracy, objectivity, and fairness of Department decisions regarding validation and segregation. Decisions to gang validate a prisoner and whether to give him or her a SHU term begin and end with CDCR employees. There is no review by anyone outside the Department. This is especially problematic because as then Undersecretary Scott Kernan candidly admitted in a media interview, CDCR over-validates prisoners without proper documentation, yet these validations are still rubber-stamped and approved. Additionally as former Warden McGrath testified in the Lira case, once prisoners are isolated in the SHU based on a gang validation, there is little chance that the validation can be successfully appealed because at every level of appeal, the reviewing officer will “assume the truth of whatever is written in the chrono,” and only look for procedural errors.”Since the CDCR clearly is aware of the serious problem of proper gang validation review, some level of review must be established that is separate from IGI and OCS. Confidential informants and debriefing reports hold as high a position in the proposed strategy as currently. Because the accused will never be able to challenge this information,is inherently unreliable. Although a point system has been introduced, the highest number of points is awarded for “legal documents,” a category which does not distinguish between court decisions or findings and mere “arrest reports,” “crime reports,” and so on. Mere possession of an article with a symbol on it, appearance in a photograph in which another person displayed some sort of gang insignia or symbol, or in which a gang affiliate appeared—even if not known as such to the accused—is sufficient for points toward validation. This problem is worsened by the fact that the prisoners receive no notice of what items are viewed by the IGI as gang-related. Many items that have been used as source points to validate prisoners are not gang related, but cultural or political in nature. 5 If IGI is going to use literature and cultural symbols to validate prisoners, then prisoners should have notice of what those materials are. There are numerous other examples. Overall, there are no protections to assure that only reliable information is used to validate prisoners and send them to the SHU. C) Fails to require sufficient due process protections. The proposal gives prisoners accused of gang affiliation or of “criminal gang behavior” no additional due process over what they current have, which is woefully insufficient to protect against false validations. It does not allow accused prisoners legal assistance, establish more meaningful hearings, or give any greater attention to issues raised by the prisoner in his defense. Nothing in the proposal articulates a rejection of CDCR’s current approach of maximizing SHU confinement through the absence of independent review, use of junk evidence, and lack of due process. 3. The distinction between association and behavior is not clearly drawn. Unless this fundamental problem is fixed, the apparent change to a behavior-based model will be illusory. A) Validation as a gang member does not require allegations of any behavior. One can be validated as a gang member without any evidence of illegal gang-related conduct. In fact, validation requires no “conduct” in the usual sense of the word. B) STG-1 members can be indefinitely housed in SHU without allegations of any “conduct”! Merely for being validated as an STG-1 member, a prisoner can be confined in SHU— perhaps indefinitely, as there is no duration limit to SHU housing for “administrative” segregation. Since validation does not require conduct, this means that for STG-1 members, SHU consignment is still not behavior-based. C) For others, “serious criminal gang behavior” is required for SHU assignment, but this is so vaguely defined as to be no requirement at all. For validated STG affiliates other than STG-1 members, consignment in SHU happens only if they “choose to engage in serious criminal gang behavior or a pattern of violent behavior.” However, the definition of “criminal gang behavior” is unclear. The definition has two parts: are both required? (That is, are they connected by “and” or “or”?) Also, both parts are so broad and vague as to be meaningless. If only one part of the definition must be met, then it is sufficient that the behavior “promotes, furthers, or assists a criminal gang.” What behavior does this include? This needs to be spelled out, and it should include a requirement of illegality or violence. Specifically, no prisoner’s participation in a past or future hunger strike or other non-violent expression of protest should be used against him or her as evidence for gang validation purposes. Rather, it should be treated as protected speech. Alternatively, if the second part of the definition is sufficient by itself, someone can be sent to SHU indefinitely for “conduct that leads to and includes the commission of a violation of policy demonstrating a nexus to a criminal gang.” Again, this is too vague and broad to exclude innocuous behavior. There should be a requirement, at the least, of illegality or violence. Flashing gang signs or having tattoos should not get one an indefinite SHU term, but apparently it will be sufficient to do so. Currently, prisoners can be and are validated as gang affiliates based on “behavior” as innocuous as speaking to or exercising with a gang member, regardless whether they know of that person’s status. The proposal does not appear to preclude the use of such innocuous behavior as a source item. In the “visitor” section (page 22), any person saying “hello,” could be considered a visitor – even a family member. This section appears to again imply that association is the same as behavior. Like the “association” section itself, no distinction is made about whether the prisoner welcomed the contact, leaving people open to receiving points through no action on their part. The current regulations require that a validated prison gang member or associate be designated as “Current Active” prior to being isolated in the SHU for an indefinite term. The “Current Active” and “Inactive” classifications, which indicate behavior-based intentions, were completely removed and replaced with “Member,” “Associate,” “Suspect,” and “Monitored”–all status-based classifications. Removing the behavior-based classification all together is a step in the wrong direction. Family relationships lead to assumptions about gang affiliation. In addition, items that have nothing to do with criminal gang activity such as birthday cards or having the address of a family member is taken as evidence of gang affiliation. Tattoos or body markings carry 6 points toward validation though these are not, in and of themselves, indicative of criminal gang behavior. 4. The reach of the validation net is greatly expanded. By switching from a “gang validation” process to an STG process, and increasing the levels to STG I and STG II, the Department is expanding the net very widely with respect to potential prisoners that will be sent to SHU. The STG II database will reach well into the community and these designations have been used very pervasively and discriminatorily in other states. Such action is already happening in California, but this proposal formalizes and strengthens the process. The new policies also create two new categories beyond the present prison gang categories: “suspects” and those being “monitored.” This move also further expands the net and has the significant potential to enlarge the SHU population. The STG II list is labeled “examples” and could be expanded easily. No instructions are given about how this category can be expanded. A memo attached to the new strategy proposal immediately begins a process of re-assessing Administrative Segregation prisoners who may be “example STG-I associates,” and placing them in the SDP, thereby consigning them to SHU status. Therefore, the policies take away with one hand what they appear to give with the other. 5. The proposal establishes no time limit on SHU confinement and fails to lessen the extreme isolation and deprivation. Under the proposed strategy, a prisoner can still spend an unlimited number of years in the SHU. Nothing in the new strategy in any way limits or caps the length of stay in solitary. There should be a maximum duration for SHU confinement and deprivation. The proposal also leaves intact the basic conditions of extreme isolation and deprivation for all prisoners housed in SHU except those in the latter half of Step 4. Extreme conditions are unnecessary and counterproductive. The literature on the so-called “SHU Syndrome” is abundant. Conditions of extreme isolation and deprivation violate the recommendations of the 2006 bipartisan Commission on Safety and Abuse in America’s Prisons, which included ending conditions of isolation even for those who must be segregated as a last resort.6 It also violates human rights law. For all SHU prisoners for whom it is appropriate, and to the extent consistent with everyone’s safety, some normal human contact and great physical comfort should be restored. We have received numerous reports that adequate medical care and pain management are withheld for SHU prisoners. 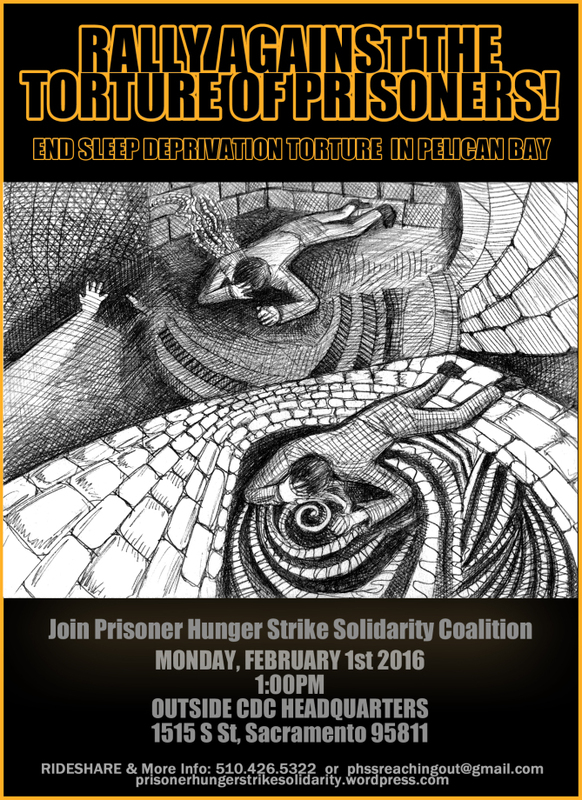 Adequate medical care was one of the five core demands of the hunger strike. The withholding of adequate medical care and pain management is not an appropriate tool for eliciting behavioral change, and is barred by legal and moral principles. Such practice is purely punitive and runs counter to the purported administrative nature of SHU confinement for gang affiliates. Thank you for the opportunity to provide this input as you modify your approach in this area. We encourage you to significantly redraft your proposal in line with our five principal concerns. Far too many prisoners are currently housed in SHU for lengthy periods: hundreds have been in the SHU for five years or more. We appreciate that each current SHU prisoner’s status will be reviewed on a case-by-case basis and hope that this review will result in a significant reduction in SHU population. Finally, we encourage CDCR to explore and adopt other non-punishment administrative strategies to address the negative impacts of gangs as noted in the “Background” section of the proposal. Hopefully, reducing prisoner crowding (now underway) will help. Other strategies could include increasing meaningful programming (education, job-training, self-help groups, family visits, exercise opportunities, etc.) throughout all institutions. These programs have been woefully reduced in recent years. Another strategy would be to reduce the influx of drugs into the prisons by searching CDCR staff, widely considered to be their primary source. While not a definitive list, we find the focus of the proposed “prevention, identification and management strategy” still rather limited to the current interdiction and suppression approach. 4 Lira v. Cate 2009 U.S. District Lexis 91292, 87. Quoting former Warder McGrath’s deposition on the gang management policy. 5 In a case recently before the Northern District Court, the Court expressed concern about “the possibility that defendants [IGI] may have taken a race based short cut and assumed that anything having to do with African American culture could be banned under the guise of controlling the BGF.” Harrison v. IGI, No. 07-CV-3824(SI), 2010 U.S. Dist. LEXIS 14944, at *3 (N.D. Cal. Feb. 22, 2010).